When you look at a map of New Zealand it can be a bit overwhelming to a student. New Zealand is broken into several territories. I found a simple New Zealand map that showed the territory borders. Then I colored and labeled a sample with only Territory names. This was a choice on the shelf after we located New Zealand on the globe and discussed the map as a whole group. A student is asked to try their hands at this activity prior to coloring the New Zealand Flag. 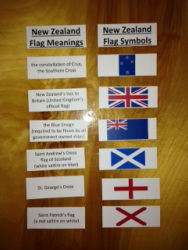 I researched the history of the flag and how each part came to be on the flag. Then I made a simple matching work between each symbol and what is was or meant. I am trying to find new ways to present flags that doesn't limit it to the simple coloring of the flag. New Zealand has unearthed a handful of different dinosaur fossils over the years. I discovered that these five (Mosasaur, Pterosaur, Sauropod, Ankylosaur, Plesiosaur) were among those that have been discovered. 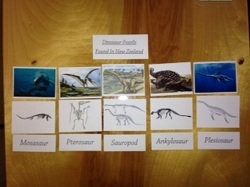 For this work I find a photograph depicting each of the dinosaurs, a skeleton of each of the dinosaurs, and label cards. The students lay out the photographs at the top of their table or mat, then match the skeleton, and lastly the labels. Each card is color coded on the back for a self check. I split this into three separate works. The hand alphabet signs are split into two works and the numbers are separate. One of the top languages recognized in New Zealand is sign language. Students first match the hand sign with the correct letter or number. Once they have matched all the cards, they then select at least three to practice themselves.